Great balance of sweet/bittersweetness, with accent notes of cinnamon spice, dried apple, vanilla, and candied walnut. Acatenango is one of the under-appreciated growing regions of Guatemala. It has always been overshadowed by nearby Antigua, and in fact, many Acatenango coffees were sold as Antigua lots for many years. 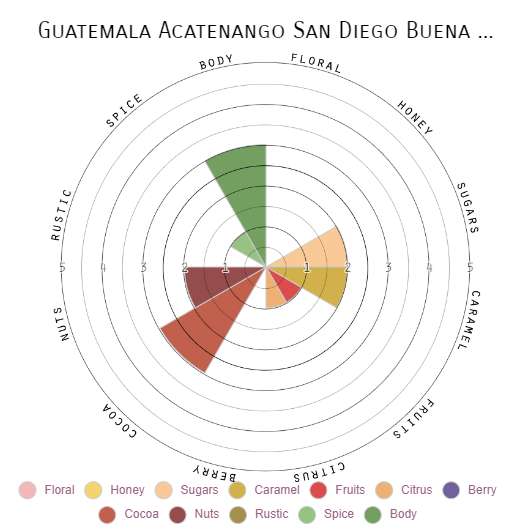 But Acatenango coffees come from some of the most beautiful farms, and San Diego Buena Vista ("SDBV") is a case in point. The care and attention given to their farm, mill, and equipment shows their dedication to the highest quality coffee bean! These beans are wet processed.